Medical technologies provider DJO Global has introduced new osteoarthritis (OA) knee brace, which will offer pain relief to individuals who suffer from the incurable and degenerative joint disease. The OA Reaction TriFit Knee brace from the company's DonJoy brand will offer pain relief to individuals who suffer from moderate to severe knee OA caused from an active lifestyle (overuse), as well as suffer from excess body weight (obesity) and the effects of aging. TriFit features three advanced technologies such as Web Tech, Exos Tech and Boa Tech, which will enable OA sufferers to move freely without pain. Web Tech is a shock absorber that helps with full knee extension and patellofemoral (PF) tracking , while Exos Tech offers a heat thermoformable custom fit that surrounds around the knee. Boa Tech uses a micro tension adjustment system, which pulls everything together to offer three-dimensional protection. DJO Global bracing and supports president Steve Ingel said: “With more than 40 percent of knee replacements occurring in patients over the age of 65 and the average onset of knee OA occurring at the age of 553, there is an inherent need for non-invasive, non-addictive methods to control pain and to support maintaining an active lifestyle. 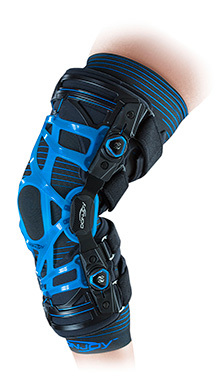 DJO Global produces rigid and soft orthopedic braces, hot and cold therapy, bone growth stimulators, vascular therapy systems and compression garments, therapeutic shoes and inserts, electrical stimulators for pain management and physical therapy products. The firm markets its products under different brands such as Aircast, Chattanooga, CMFTM, Compex, DonJoy, ProCare, DJO Surgical, Dr. Comfort, Bell-Horn and Exos. Image: DJO Global’s new TriFit knee brace will offer pain relief to individuals who suffer from moderate to severe knee OA. Photo: courtesy of DJO Global, Inc.